Since August 2017, there has been an ongoing outbreak of plague in Madagascar, Africa. In 3 months’ time (1 Aug – 24 Oct 2017), more than 1300 cases were reported, including at least 90 deaths. Thirty-seven out of 114 districts of the country have reported cases (http://www.afro.who.int/health-topics/plague/plague-outbreak-situation-reports). Around two-third of reported cases in the current outbreak in Madagascar were pneumonic plague. At least 70 healthcare workers were infected. Seychelles, Madagascar’s neighboring country, has reported imported cases. 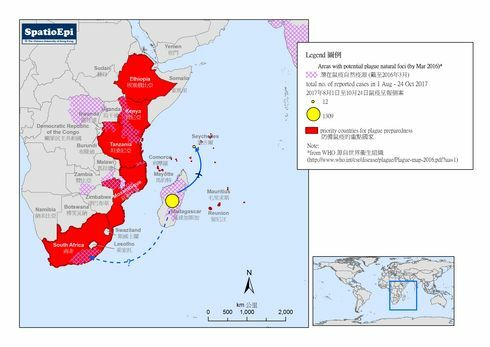 Besides Seychelles, another 8 countries (marked red on the map), which have trade and travel links to Madagascar, have been identified as priority countries for plague preparedness by WHO. Some of the 9 countries were identified as areas with potential plague natural foci (purple hashed areas) by WHO previously. 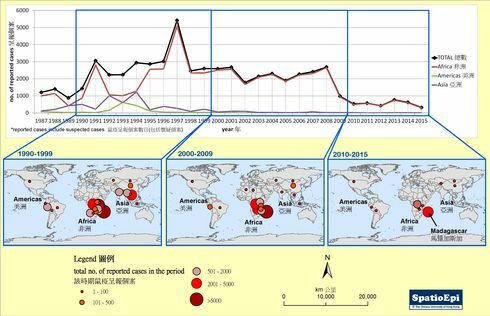 Please refer to our another SpatioEpi map for the epidemic of plague in these places in the past decades (http://www.spatioepi.com/detail.asp?id=0167d&defaultcat=s012). Data for the map were extracted from WHO. Plague is caused by the bacteria Yersinia petis, which is transmitted from rodent to rodent by infected fleas. If bitten by an infected flea, a person usually develops a bubonic form of plague, which is characterised by a swelling of the draining lymph node. While bubonic plague is the commonest, there are also the septicaemic form and pneumonic form. Septicaemic plague occurs when infection spreads directly through the bloodstream, while the pneumonic form is the most virulent but least common. Plague also spreads from human to human by inhalation of aerosolised infective droplets, in the absence of flea or animal. 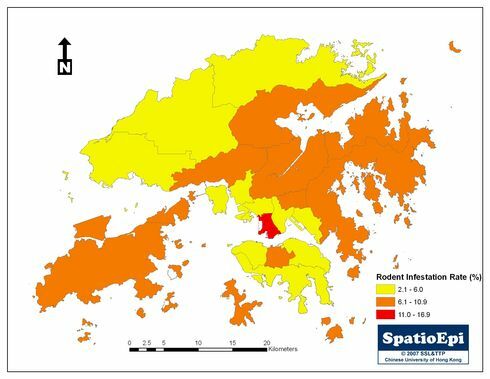 A Hong Kong outbreak of plague occurred in Tai Ping Shan of Sheung Wan District in 1894. In fact, the bubonic plague bacillus was isolated in Hong Kong at that time by Alexandre Yersin from France. Where do the rats come from?